At the very core of the enterprise of education there exists the grand ambition of forming human beings: ‘forming’, ‘shaping’, ‘becoming’, ‘growing into’ – are some verbs associated with the enterprise of education. Yet, as teachers we often get entangled with other aspects of education, such as transmitting a culture’s accumulated knowledge and skills; so that education becomes synonymous with instruction, which is definitely important, but certainly not the core of ‘education’. Henry Giroux, an American cultural critic elucidates this further when he says: “Schools should foster public values and not merely advance excessive individuals, competitiveness, and intellectual consumerism.” Though Giroux has written primarily in the American context, his ideas hold true for almost all parts of the world today, which are consumed by neo-liberalism1. The world that our children inhabit is certainly very different from the one say even 20 years ago. And the significant markers of change are aspects of technology, media and the consumerism they foster. Media and technology have played the dual role of being a boon and a bane (a popular essay topic for students!) and have also supposedly made inroads into schools – most schools boast of all kinds of technologically supported learning systems and focus hugely on audio-visual learning. The use of technology and media, however, remains restricted to being an aid to instruction and to facilitate the learning of concepts. Very few are the instances where media is used to serve education in the broader sense that Giroux and Freire above intend it to. Media pedagogy, as it is called in the west, is in fact a cutting-edge form of pedagogy which is used by teachers to help students deconstruct the messages they receive from mainstream media, and analyze them critically. This helps them understand that media is not neutral and also see their relative position/location vis-à-vis popular culture. In India such an approach is yet to be used in schools, although courses in Cultural Studies in higher academics deal with such issues. What does exist in India at the moment is a programme called School Cinema2, a project started by EduMedia – that aims to make issue-based films for children, teachers and parents. These are short films (average duration being around 15 minutes) which are based on researched issues and directed by some of the finest talent in the country so that they are anything but didactic and boring. The film is used as a tool – a conversation starter for the teacher to initiate a dialogue or discussion with children and is followed up by a workbook which helps children to consolidate their take-away both from the film and the discussion. The three-pronged approach that School Cinema has in making films for students, teachers and parents is aimed at a holistic education for all these three groups – teachers and parents are as much a part of the focus as are students. The kinds of issues that are dealt with include tackling failure, relationships, sexuality, peer pressure, exam fear, stress, adolescent issues and the like. The operative words are ‘social learning’ – learning how to relate to people and things and to distinguish between what is important and what is peripheral. That is hugely what value education is also about. Freire’s words quoted above speak of the process of ‘self-experience’, however the self can only be experienced in relation to others. In the technology infested world that children live in today, it is important to remind them that no woman/man is an island – that we are all inextricably bound. The concept that School Cinema is, is to be applauded, with teachers becoming more sensitive to the possibility of using technology and media in more creative and fruitful ways so that the education of the students, as well as that of teachers and parents becomes an ongoing process and a more complete and meaningful one. The author is a Senior Researcher in Education with Digantar, Jaipur and a student of education. She can be reached at simranluthra@gmail.com. “India is the world’s largest film-making country yet produces very few films focused on children and even fewer on education. Films have the unique power of story-telling, the ability to connect emotionally, appeal visually and provoke thoughts. They address real-life issues in an engaging and entertaining manner without sounding preachy or patronizing. It is this facet of films that engages children. From an education point of view, it’s a known fact that an audio visual medium has a much better impact on children than monologues. Films are an excellent medium of communicating and imbibing lifeskills, values primarily because it catches the kid in an emotional/non-rational mood.” – source: Tabassum Modi, Executive Director – EduMedia India. 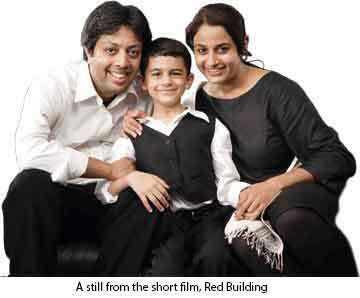 Red Building Where The Sun Sets has been directed by well-known director Revathy, who has won several prestigious awards earlier for her work. The story is about a couple and their son, and about how frequent arguments between the couple affect the son to a serious extent. This film is meant for parents and shows how children are silent spectators to everything they do, and how their actions and words can unknowingly affect and influence children. The Finish Line has been directed by Akshay Roy, a director who comes in with a strong background assisting in movies like Lakshya, Water, The Namesake, Vanity Fair and The Bourne Supremacy to name a few. The story revolves around two friends from school who were competitive sportsmen but only one succeeds in making it big, while the other fails due to lack of support and biased approaches adopted by the physical education teacher, who plays a vital role in their lives. This is a film for teachers and students and deals with the issue of partiality and how it can affect a student’s future. There is also an underlying message which talks about never letting someone else’s views and opinions affect our goals and decisions in life.